How should I introduce new weaning foods to my baby? 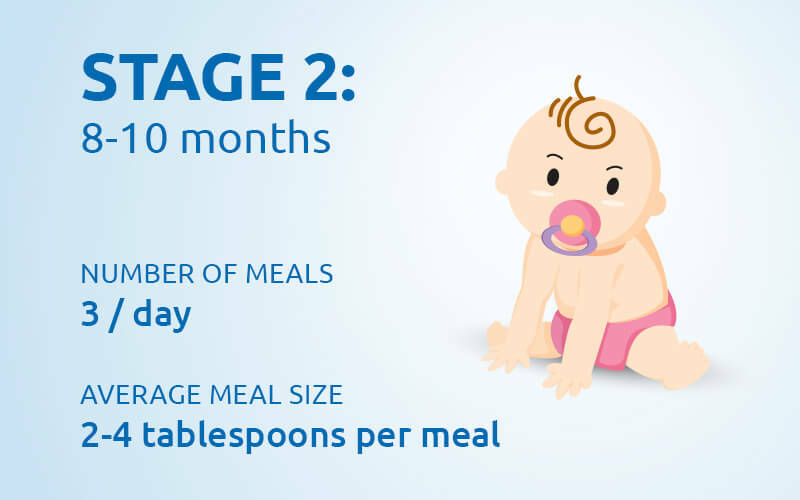 Start baby on solids gradually, one at a time. 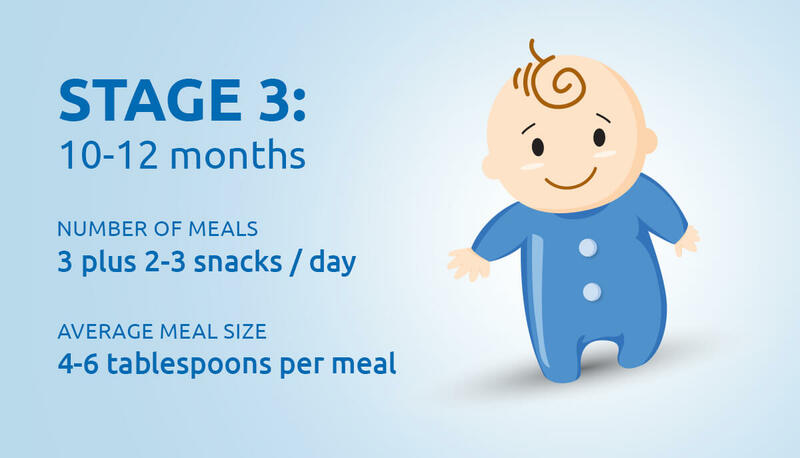 Offer your baby a new food a few times over the course of three to five days before trying another new food. This way you’ll be able to tell if your baby has an allergic reaction to something. Although you want your baby to eat a wide variety of foods, it takes time for him to get used to each new taste and texture. And each baby will have individual food preferences, but in general, your baby could start the transition with pureed or semi-liquid food, then move on to strained or mashed food, and finally graduate to small pieces of finger foods. If your baby is moving on from cereal, offer a few tablespoons of vegetables or fruit in the same meal as a cereal feeding (or mix them together). All food should be very mushy – at this stage your baby will press the food against the top of her mouth before swallowing it. In the early stages of weaning, it’s more important to get your baby used to the taste and texture of food rather than just filling him up. Until he is 6 months old, the calories and nutrients he needs will come from breastfeeding or formula milk. Gradually, as he becomes more used to an increasing choice of solid foods, milk feeds will decrease. From 6 months, start with one meal a day. They won’t want to eat much at first so even after starting solids, you can still offer them a milk feed too to compliment this. As the number of meals increases, you should decrease the amount of milk your baby is drinking. 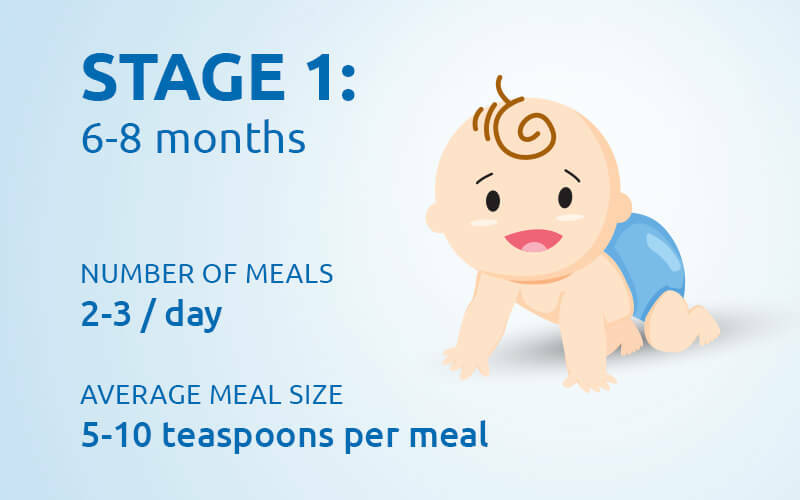 Up until the age of 10 months old, your baby should get used to eating 1 to 2 meals a day. 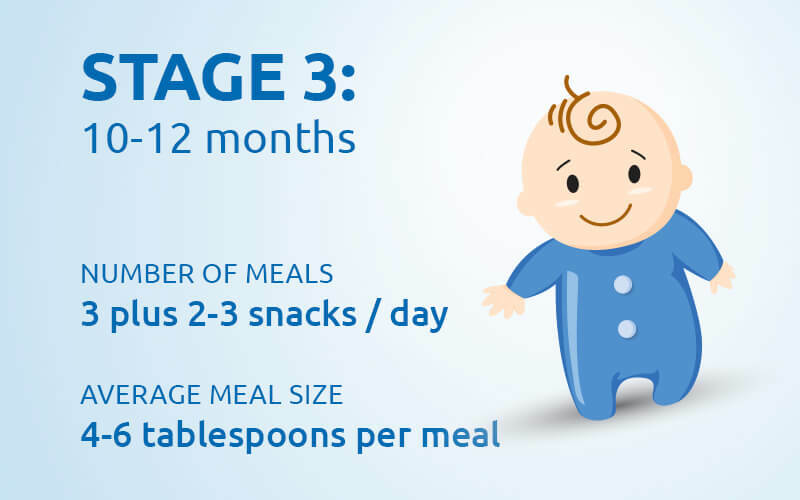 From about 10 months old, your baby should be ready to eat three meals a day. From here onwards, your baby should get the majority of their calories from solid food and should be having three meals a day along with some snacks. Offer your baby a sippy cup or beaker of water with meals. This is important to keep your baby hydrated and avoid constipation. The more active he is, the hungrier he’ll be. Between 6 to 12 months, he should also be able to sit up on his own and, as such, will be using more energy by crawling and maybe even walking. All this physical activity means that he’ll need more solid foods to sustain this newly-found energy. The easiest way to ensure your baby gets used to something is to be consistent. As soon as you find a mealtime routine that fits everybody’s schedule, try to stick with it. That way your baby will come to expect food at specific times of the day. Serve the main protein meal at lunchtimes, because if he becomes tired later on in the day, he will be less likely to eat it. Avoid feeding him in-between meals, even when he’s very hungry. It’s okay to give him small healthy snacks, but even them out with relation to the main meals. Try not to bribe him into eating one thing with something you know he prefers. What type of food should I introduce each month? Here’s a handy weaning guide on what foods you should give to your baby when you start introducing solids. What should be the first baby foods to feed my baby? Start by offering very smooth, runny puréed foods. Continue to offer breast milk/usual fortified infant formula. Vegetables like carrots, squash, potatoes, sweet potatoes, green beans, zucchini and green peas one at a time waiting 3 – 5 days in between to check for any allergic reaction. Fresh fruits such as apple, banana, peaches, pears, melon, apricots, avocado, and papaya can be introduced one at a time waiting 3 – 5 days in between to check for any allergic reaction. Once your baby is used to eating vegetables, fruit and cereal (plain rice) you should introduce small amount of other protein rich foods, such as: puréed meat, fish and chicken, chickpeas, lentils or other pulses, egg yolk, full-fat pasteurized dairy products, such as plain yoghurt. Your baby will gradually move towards eating three meals a day. It will be a mixture of soft finger foods, and mashed or chopped foods. continue to offer breast milk/usual fortified infant formula along with mashed vegetables, fresh fruits and starchy foods such as Baby breadsticks, baby rice, breakfast cereals, oats and pasta. Fruit juices, but make sure that they are 100% unsweetened and pasteurized. Food rich in protein such as soft mashed meats, chicken, lamb, beef, liver, egg yolk, pasteurized cheese, and pureed legumes (black beans, chickpeas, fava beans, black-eyed peas, lentils, and kidney beans). Also, full fat dairy products such as yoghurt. Your baby will now be eating three meals plus 1- 2 snacks per day, which will be a mixture of lumpy, chopped foods & soft pieces of finger food. Continue to offer breast milk/usual fortified infant formula along with mashed vegetables, fresh fruits, food rich in protein and other starchy foods. During this time, encourage your baby to self-feed. Include soft finger foods such as raw fruit and vegetable sticks, as well as sandwiches or toast. How much do I feed him when introducing solids? You don’t need to feed him 3 meals a day. Start slow and small. 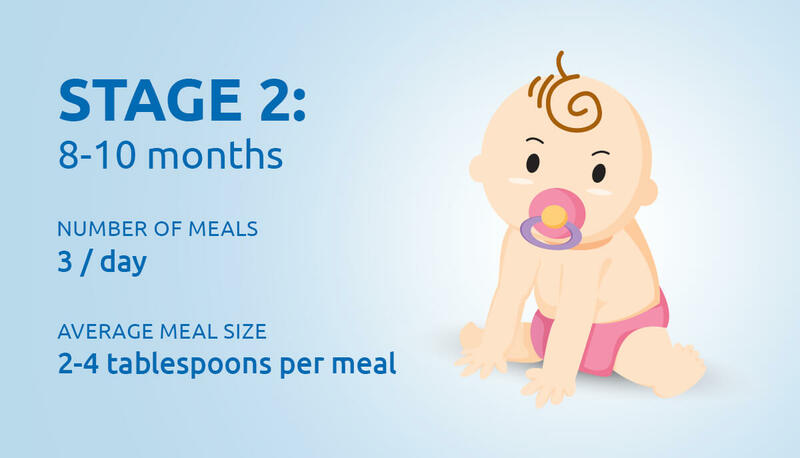 We’ve created a guide for weaning portion sizes to give you an idea about how much to feed your baby, and when. Gradually, you’ll be able to increase the amount and variety of food your baby eats, until he can eat the same as the rest of the family, but in smaller portions. That’s why it’s a good idea to wait until he is ready. When he is ready, he will want to feed himself, he’ll be able to swallow properly and there’ll be less mess. Start with one small spoonful at a time. Always stay with your baby when he is eating. Be patient, allow your baby to feed himself, using his fingers. If he’s really not interested, don’t force him. At the beginning, feed him plain rice or vegetables with no salt, sugar or no other food mixed in with it. Learn what he does and does not like, which will help in creating future recipes. Use a little of your baby’s usual milk (breast milk or fortified formula) to mix the food to the desired consistency. Feed your baby a wide variety of colorful vegetables and fruits as soon as they can eat solid food. because different colors of vegetables and fruits contain a wide range of vitamins, minerals, fiber and phytonutrients. 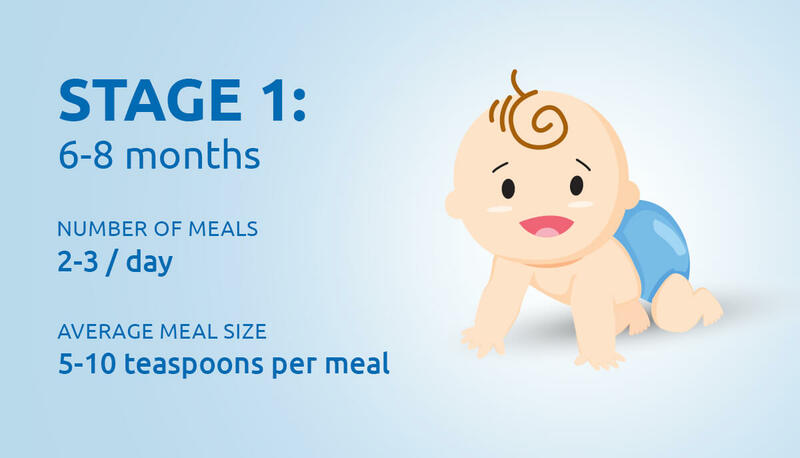 Offer your baby only one new food at a time, and feed it to them for 3-5 days before offering another new one. This also gives you time to look for food allergy signs, such as rash, hives, coughing, diarrhea or vomiting. Do not serve your baby a mixed-ingredient food until you have fed each individual food separately, and you know that they are not allergic to any of the ingredients. If he refuses to open up for the next bite – sometimes a baby will keep his mouth closed because he hasn’t yet finished with the first mouthful, so give him time to swallow.